Snowball Slam is one of the action minigames featured in New Super Mario Bros.. It is among the minigames exclusive to Vs. Battle mode, one of the game's multiplayer modes. 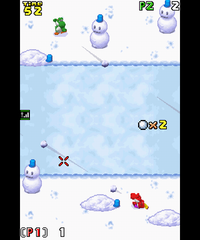 The game involves the players, all as Yoshis, competing in a snowball fight to earn the most points or in thirty seconds. If there are more than two players, the game randomly chooses teams before the game begins. Players move by dragging the stylus across the snow area on the Touch Screen, and can toss snowballs by tapping the ice on the top of the Touch Screen. Both players start with ten snowballs, and can hold no more than that many at a time; if it is a two versus one match, the solo player starts with and can hold twenty. If a player runs out of snowballs, they can create more by tapping the Mr. Blizzards on the screen, causing them to melt, and running into them. A Mr. Blizzard that has been used to make a snowball reappears seconds later. Hitting one of the opponent's snowmen with a snowball earns the player one point, and hitting an opponent earns five. The players that earn the most points before time runs out win. Everyone who is on the winning team gets the number of points chosen before. Everyone else gets nothing. It's a snowball fight! With teams! Tap the top half of the Touch Screen to hurl snowballs, and tap the bottom half to move to that spot. If you run out of snowballs, get busy and make some more! This page was last edited on December 3, 2018, at 02:18.